A few parts from Fuso, already posted or upcoming. Funnel, vents and jackstaff were removed from the pinnace and stowed on deck when the boat was carried on Fuso. 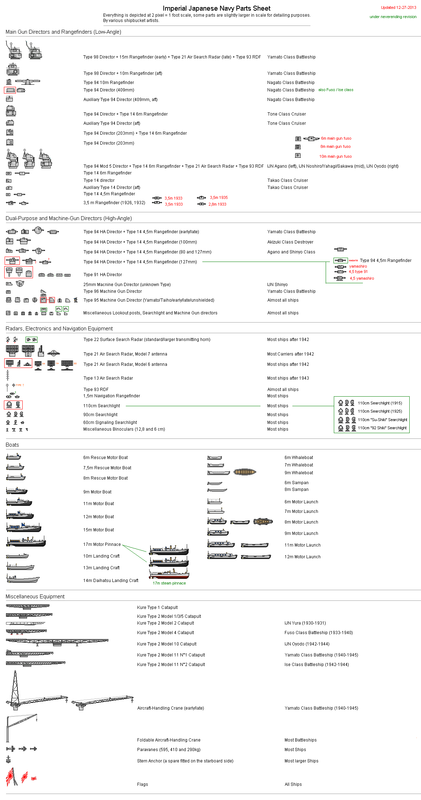 (Main guns will come ina simplified sheet at a later date as the post-1933 fits are yet to be drawn). Those steam pinnaces are absolutely fantastic with that amazing attention to detail! BRAVO! 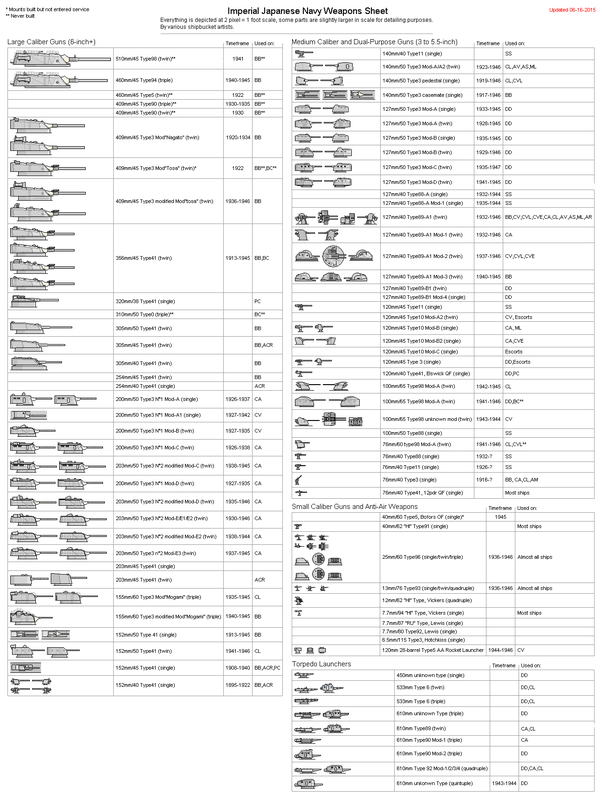 Since the last update (now 1 year-and-a-half ago) I've added eighteen new types of guns and three more torpedo tubes, other than refining and reworking some of the gun mounts that were already there. Still, some fields are still blank, and there will be more that needs to be added before the sheet could be called complete. Anyway, at least now you guys can benefit from it and not just myself. 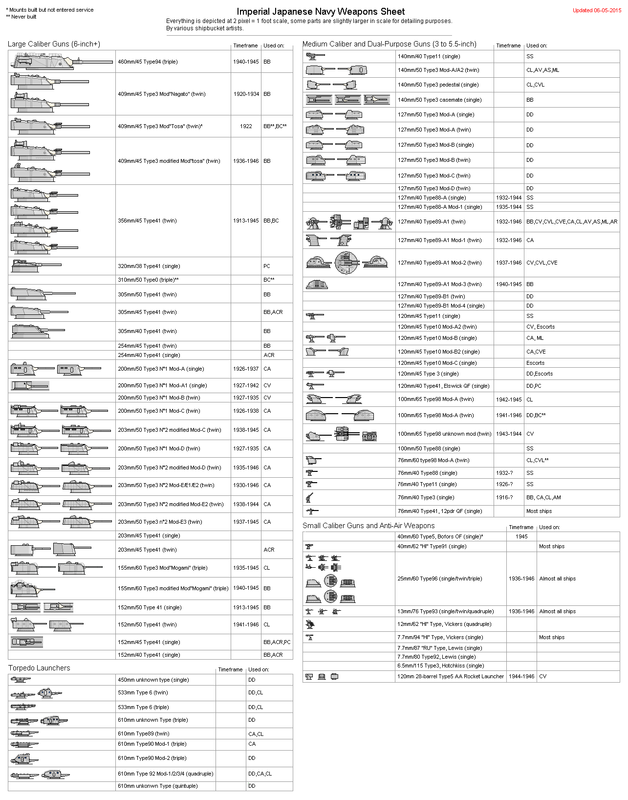 A similar update will come (hopefully soon) for the Miscellaneous sheet too.. here is a link to the WIP to somewhat fill the gap for anyone who might want some updated equipment. 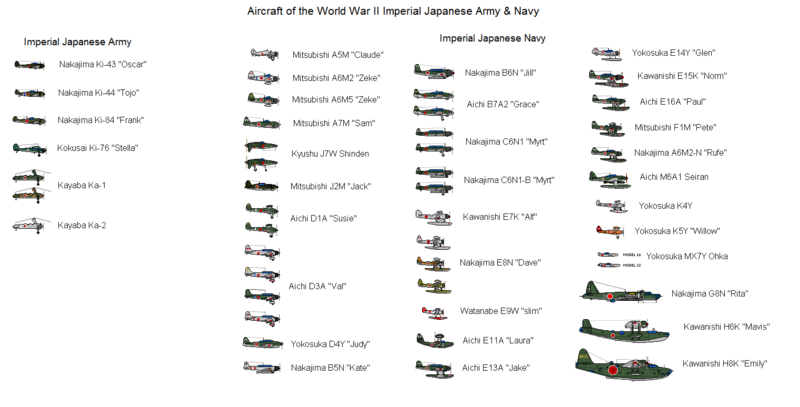 also, I'm reposting the IJN/IJA aircraft sheet, done by Emperor_Andreas, which has been lost with the Majhost meltdown. I've added to it the new Kayaba Autogyros and the J7-Shinden recently drawn by Magus. The only thing I would note is the missing 18" twin for the '13' battleships, or a placeholder for it. Technically, I'm also missing placeholders for the twin/triple 409/45 planned for the Hiraga1930 Battleships and the massive 20inch mounts of the A-150, but I'm plan to add at least the blank once I've started to fill the other missing guns. Regarding that plane sheet, the A7M appears to have a 3-bladed propeller, when it should be a 4-bladed prop. You are right, it will be fixed. -152mm/40 Type 41 single open and shielded mounts from early Battleships and Armored cruisers. -127mm/50 Type3 mod-D DP twin turrets from the Yugumo and Shimakaze class Destroyers. -610mm unknown tipe quintuple torpedo tube fromt he Shimakaze class Destroyer.